Photo above: Montgomery County Council member Phil Andrews talks to rally Friday to kick off Gerrymander Meander. Runners and bike riders from Maryland’s oddly shaped 3rd Congressional District took to the streets last weekend, urging state legislators to reform the drawing of district lines. The three-day event featured an around the clock 225-mile expedition through the district from Owing Mills to Towson to Fort McHenry to Columbia to Olney, reaching into portions of Baltimore, Howard, Montgomery and Anne Arundel counties. Participants traveled by foot, bike, kayak, and motorboat to draw attention to the configuration drawn by Democrats in Annapolis after the 2010 Census report. 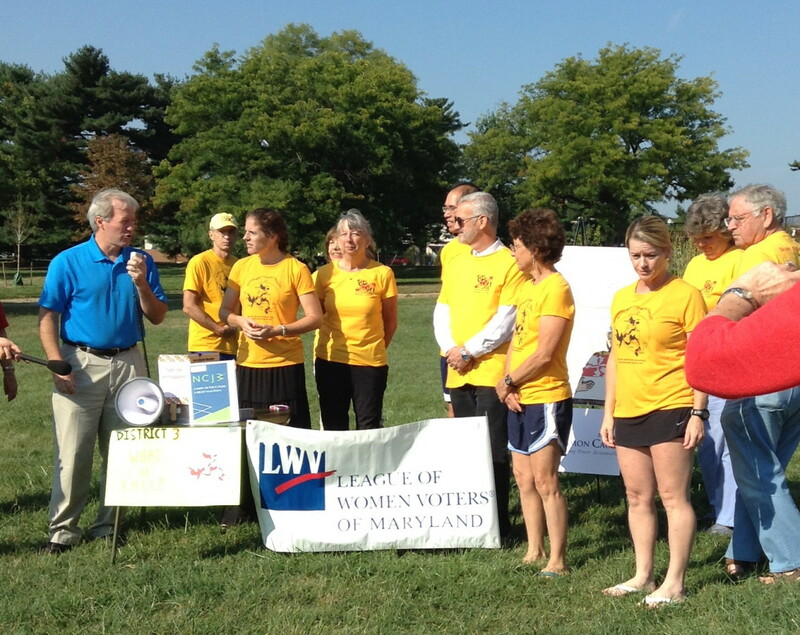 The trek started Friday morning in Baltimore’s Roosevelt Park with a kick-off rally by the Tame the Gerrymander Coalition that includes Common Cause Maryland, the League of Women Voters of Maryland and the Annapolis section of the National Council of Jewish Women. “We need to persuade the General Assembly to set up an independent commission. We need to have standards…that apply throughout the country for redistricting,” said Andrews. Reforming the way congressional and legislative districts are carved up in Maryland may have been declared dead on arrival by Democratic leaders, but the Hogan administration and a few progressive Democratic legislators are keeping the issue alive at hearings this week. The co-chairs of the governor’s redistricting commission presented their proposal for a new commission completely independent of politicians to the House Rules Committee. Del. Kirill Reznik, D-Montgomery, is proposing his own version of an independent commission to be made up of the nonpartisan legislative staff.